Ali, “US Imperialism or A Just Response To Terror?”, Georgetown University, Washington DC, 17 April 2002 (Audio). With the rubble of the Twin Towers barely cleared away, Hitchens goes head-to-head with a former comrade on the Left who published a book blaming America for visiting the attacks on itself. I would like to have placed this one in the top category alongside the all time greats as Hitchens’ opening speech is a rip-snorting broadside against the hypocrisy and double-standards that was soon to lead to his departure from Liberalism in favour of Neo-Conservatism. But alas, he doesn’t use his time for a rebuttal and the audio cuts out before the first audience question is answered. In a hommage to my atheist blogosphere opposite number, Lukeprog of the now-archived Common Sense Atheism, who compiled a review of all William Lane Craig’s debates, I publish here a similar collection of my thoughts of the debates of my intellectual hero, the late Christopher Hitchens: journalist, literary critic, author, scourge of the faithful and proud member of the Four Horseman with his international bestseller against the forces of theocratic fascism, god Is Not Great: How Religion Poisons Everything. Hitchens did many debates and I have mainly included formal debates and panel discussions in front of an audience. I have mentioned some of Hitch’s many TV and radio interviews and discussions, but only where there was a single topic on the agenda, as opposed to the zillions of time he appeared on C-SPAN and Bill Maher to discuss the general politics of the day. I may have missed out on some; suggestions in the comments section, please! The Not So Good (for the remainder of this post). Craig, “Does God Exist?”, Biola University, Los Angeles, 4 April 2009 (Video / MSP review / MSP review one year on in three parts). This one hurt quite a lot. While not the massacre that the first blog reports had us believe, Hitchens simply did not prepare to take on “professional debater” (© Richard Dawkins) Craig and wanted to debate whether religion was good for the world, as opposed to the actual topic under discussion. Craig showboats in front of his home crowd and Hitch lets him get away with smugly asserting that his five “arguments” are irrefutable. D’Souza Round I, “Is Christianity the Problem?”, King’s College, New York, 22 October 2007 (Video / Audio). Hitch lands a few punches, but overall he was not on top form on the night. D’Souza is loud, longwinded and gets the last word on many points through filibustering. There is also plenty of disingenuous quote-mining of authorities and misrepresenting of Hitch’s arguments. Hitchens/Jackson –v- Arkes/Markson, “The Death Penalty Debate”, National Review & The Nation Institute, 7 April 1997 (Video). Hitchens shares a platform with the Reverend Jesse Jackson, who he was later to throw in the same damning category as the “Reverends” Jerry Falwell, Al Sharpton and Pat Robertson as someone who can get away with offences to truth and morality by virtue of calling himself a man of faith. Hitch speaks against the death penalty persuasively, however, he is up against two equally convincing opponents and the clash is best described as a draw. The Q&A section descends into farce due to a strict moderator and hapless audience members straying off topic. For Hitchens completists only. Galloway, “The Iraq War of 2003 was just and necessary”, Baruch College, New York, 14 September 2005 (Video). I have consigned this one to the lowest category, not because Hitch loses the debate, but because it’s deeply unpleasant watching him share a platform with such an unsavoury, hard-left demagogue who openly supports brutal Islamist regimes. Things get pretty personal and Galloway resorts to schoolyard name calling. At least he gets his comeuppance from the NY crowd by suggesting that America brought the 9/11 attacks on themselves. Sully your eyes and ears by watching it if you must. Dawkins/Dennett/Harris/Hitchens, “The Four Horsemen”, 30 September 2007 (Video). A superb discussion with the three other Horsemen about religious faith in the aftermath of their recent God-bashing books. I will say no more: sit back and enjoy. Hitchens/Dawkins/Grayling –v- Spivey/Neuberger/Scruton, “We would all be better off without religion”, Intelligence Squared, Methodist Central Hall, London, 27 March 2007 (Video). Hitch teams up with fellow atheists Richard Dawkins and A C Grayling who wipe the floor with three half-hearted apologists, whose main arguments in support of religion is that is has produced a lot of nice art and “you’ll never get rid of it”. His opening speech slamming “the parties of God” is a classic Hitchens moment. Hitchens/Fry –v- Widdecombe/Onaiyekan, “The Catholic Church is a force for good in the World”, Intelligence Squared, London, 19 October 2009 (Video / MSP review). Yours truly was there on the night and it was a pleasure to see Hitch stick a red hot poker up the Holy See’s backside. Hitch’s teammate Stephen Fry was a true revelation. Catholic defenders Ann Widdecombe and the barely comprehensible Archbishop John Onaiyekan were lambs to the slaughter. “Freedom of Speech Includes the Freedom to Hate”, Hart House, University of Toronto, 15 November 2006 (Video / MSP transcript of Hitchens’ speech). Hitchens debates students from the University (and is given twice as much time at the lectern!) and gives an absolutely barnstorming 20 minutes and 52 seconds in which the Hitch blows hate speech and Holocaust denial laws as well as “the Religion of Peace” to smithereens with his wonderful Richard Burton-esque delivery. Hitchens/Gourevitch/Wilkinson –v- Khan/Cesarani/Matsuda, “Freedom of expression must include the license to offend”, Intelligence Squared US, 16 October 2006 (Video / IQ2 page includes MP3 audio). Hitch makes many points that will be familiar to fans of his speech at Hart House, Toronto (see above) but this is still a terrific clash with a pack of wet-lettuce liberals who are afraid of angering the Islamists and the best way of dealing them is to be nice to them. Hitch is also blessed with two equally literate, persuasive and witty debating partners. Cartoonist Signe Wilkinson’s opening salvo is a hoot, while fellow-journalist Philip Gourevitch turns the opposition’s arguments on them with much aplomb. Hitchens/Aaronovitch –v- Hart/Jenkins, “A pre-emptive foreign policy is a recipe for disaster”, Intelligence Squared, London, 13 September 2004 (Video). Another convincing case made for the Iraq War as Hitchens and his partner swing the audience vote from pre-debate against the motion to post-debate for the motion. Aaronovitch makes for a formidable debating partner who holds his own rather than just being a handy side-kick; the example in his opening statement of how people in the second tower of the World Trade Centre on 9/11 responded to the impending crisis is astonishing. D’Souza Round II, “War and Geo-Politics: Is Religion the Problem or the Solution?”, Freedom Fest, Las Vegas, 11 July 2008 (Video). I don’t care how the audience voted at the end; Hitch had his revenge following his disappointing showing against D’Souza at King’s College the previous year (see “The Not So Good”), and frankly made him look a total fool. D’Souza Round III, “What’s So Great About God: Atheism Versus Religion”, University of Colorado, Boulder, 26 January 2009 (Video). Another convincing performance against D’Souza memorable for Hitch’s exposition of a trashy early 20th century novel called When It Was Dark by Guy Thorne about the chaos that ensues in the Western world when people think that the body of Christ has been discovered. D’Souza Round VI, “Is There A God? The Great Debate”, University of Central Florida, 17 September 2009 (Video). Hitchens uses the evasive D’Souza as little more than a human punch bag in this one; I’m surprised Dinesh keeps coming back for more. McGrath, “Religion: Poison or Cure in the Modern World?”, Georgetown University, 11 October 2007 (Video / Audio). 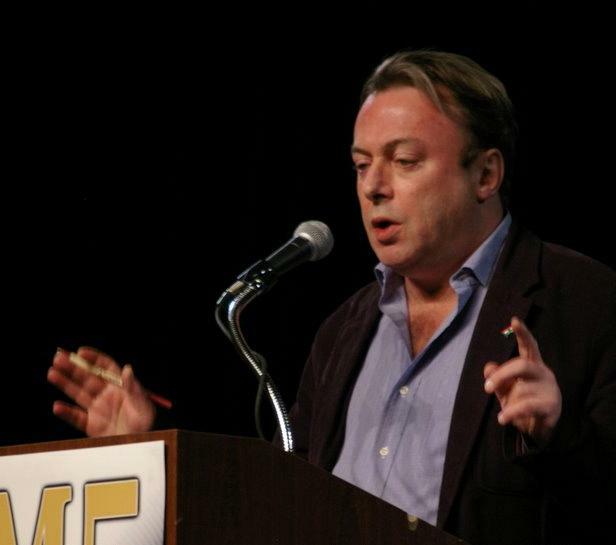 After McGrath published a disgraceful ad hominem attack against the New Atheism in general and Richard Dawkins in particular with The Dawkins Delusion?, Hitchens ripped the lily-livered, “sophisticated” theologian limb from limb. Jackson, “How Religion Poisons Everything”, Emory University, 16 May 2007 (Video). This is really good-natured debate with some excellent exchanges between Hitch and Jackson, not to mention plenty of banter about the finer details of American whiskey! Turek Round I, “Does God Exist?”, Virginia Commonwealth University, 9 September 2008 (Video / Audio). After trying to blag his way through the opening speech with his fast-talking, loud-mouth New Jersey accent, Turek quickly has the wind knocked out of him with a few well placed punches from Hitch who could not have made him look more of a fool if he’d dressed him up in Edward Woodward’s costume from The Wicker Man. Watch out for Hitch’s take on purpose in life without God during the Q&A (!). Lennox Round II, “Is God Great?”, Fixed Point Foundation, Samford University, Birmingham Alabama, 3 March 2009 (Video). Lennox was drafted in at a moment’s notice after D’Souza had to travel home to India to see his sick mother. Hitch mops up after losing the audience vote at his first encounter with Lennox in Edinburgh the previous year (see The Good). Peter Hitchens Round II, “Faith, Politics & War”, Fountain Street Church, Hauenstein Center, Center for Inquiry, 3 April 2008 (Video). Big Hitchens well and truly pulverises his conservative, reactionary, bible-bashing baby brother with superior arguments and rhetoric on the Iraq War and religion. I don’t even support the Iraq War and I thought that Christopher presented the better case. Peter whines on about civilian causalities, why we’re not trying to overthrow the Chinese regime and “the good old days” when children said their prayers before bedtime and opened doors for strangers. Sad. Wolpe Round I, “Is Religion Good for the World?”, Temple Emanu-El, New York, November 2008 (Video). Wolpe doesn’t come off too badly, but Hitch is barnstorming and makes his Jewish opponent squirm at the ethical implications of “genital mutilation” of small boys. Wolpe Round II, “Why Does God Matter?”, The College at Brockport, 2 December 2009 (Video). Another great showing against the ever-resilient Wolpe. Watch out for Hitchens’ treatment (annihilation) of Wolpe’s assertion that the public give priests a disproportionately hard time as soon when they put a foot out of line in comparison with other professionals. Boteach Round I, “God and Religion in the New Century: Divine Treasure or Poisonous Belief?”, Makor, New York City, 27 September 2004 (Video). Hitch gives excellent opening and rebuttal speeches with all his wit and panache and swiftly wins over the audience. “America’s Rabbi” Boteach shouts and screams about lack of transitional fossils, favourable genetic mutations, the Anthropic Principle and the Holocaust. Hitchens rips him in half. Boteach Round II, “Debate on God”, 92nd Street Y, New York, 30 January 2008 (Video). Hitchens is on top form for their pair’s second outing as he brushes aside more asinine ravings from Shmuley, who this time claims that the late, great Harvard palaeontologist Stephen Jay Gould “did not really believe in evolution” (!?). An utter embarrassment for religious people everywhere. Ramadan, “Is Islam a Religion of Peace?”, 92nd Street Y, New York, 5 October 2010 (Video). Hitchens, in his first adversarial debate since being diagnosed with cancer, goes to town on the religion that is anything but one of peace and shows the fake-moderate Ramadan as the pseudo-intellectual, mouth-piece for jihad that he is. Hitchens/Harris –v- Wolpe/Artson, “Is there an afterlife?” American Jewish University, Los Angeles, 15 February 2011 (Video). With Hitchens less than a year from death, this is a memorable performance from a man who refuses to give in and accept the false promises that religious faith offers him as he leaves this Earthly life. Harris also makes some excellent points, particularly with his graphic illustration in his opening statement at how the concept of an afterlife provides some comfort to certain people that once they have experienced a natural World suffused with suffering, they will be let in on the punch line when the die.